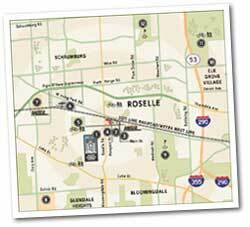 In the heart of downtown Roselle, Main Street Station is easy to find and accessible by car and train. Whichever direction you're coming from, we've compiled these easy-to-follow directions or get custom directions from your exact location at MapQuest. Take Rt. 53 to the Thorndale Ave. exit. Turn right onto Thorndale Ave. Turn south on Roselle Road and then east on Irving Park Rd. Turn south on Prospect, across the railroad tracks to the sales office on the right side of the street. Take the Eisenhower (I-290 Extension) west towards the western suburbs/Schaumburg. Continue on Rt. 53 north a short distance to the Thorndale Ave. exit. Turn left onto Thorndale Ave. Turn south on Roselle Road and then east on Irving Park Rd. Turn south on Prospect, across the railroad tracks to the sales office on the right side of the street. Take I-355 north until it merges into Rt. 53 north. Continue on Rt. 53 north a short distance to the Thorndale Ave. exit. Turn left onto Thorndale Ave. Turn south on Roselle Road and then east on Irving Park Rd. Turn south on Prospect, across the railroad tracks to the sales office on the right side of the street. Take Lake Street east to Bloomingdale Rd./Roselle Rd. Turn north onto Roselle Rd. Turn east on Irving Park Rd. Turn south on Prospect, across the railroad tracks to the sales office on the right side of the street. Compare floorplans for any of the 48 luxury condos. While Main Street Station is centrally located in downtown Roselle, you'll find that there are many recreational, shopping and other public conveniences within a short driving distance.